Homemade butter is one of those special indulgences that I rarely make. It’s always creamier and richer than store-bought butter and makes anything you put it on—from a piece of crusty bread to a stack of pancakes—taste so much more decadent. This past weekend I wanted a special topping for some sweet summer corn, but we were at the farm house and I didn’t quite have the time or patience to make a batch of homemade butter. 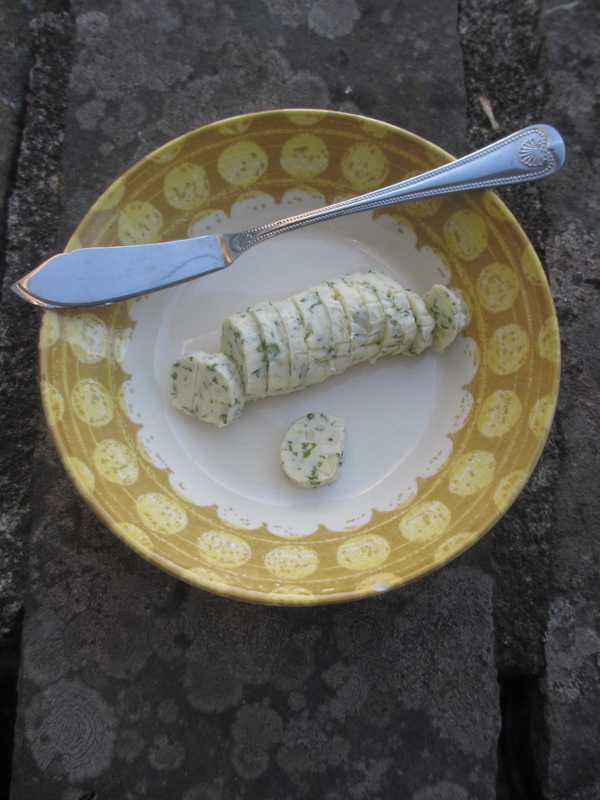 I was however able to grab some fresh cilantro from the garden and combine it with a few other ingredients we had on hand to jazz up some plain, store-bought butter. It took hardly any effort and the result was beyond delicious. It’s really quite amazing how so few ingredients can really transform a dish so much. We used the butter to top some grilled corn, but I also think it would be a great way to grease a pan before making eggs, to coat the outside of a grilled-cheese sandwich or to prepare fish with. 1. In a small bowl, combine the butter, garlic, cilantro, both salts and lime juice. Mix until well combined, taste and adjust seasonings as needed. 2. To form into butter rounds: Lay out a small piece of plastic wrap on a work surface. Place the butter mixture in the middle and fold the edges of the plastic wrap over each other to form a cylinder. Gently roll the butter back and forth, like you would a rolling pin, to smooth and lengthen the log of butter. Once your butter has reached the desired size and is uniform in thickness, twist the ends of the plastic wrap closed. Place in the refrigerator for 30 minutes or until firm. 3. Once firm, remove butter from the plastic wrap and slice into thin rounds. This entry was posted in In the Kitchen and tagged @SWWUblog, butter, cilantro, DIY, garlic, homemade, in the kitchen, lime, no-fuss, quick and delish, recipe, summer corn by Something We Whipped Up. Bookmark the permalink.